In this article I am going to describe a way to execute code in windows kernel by using windbg local kernel debugging. It’s not a vulnerability, I am going to use only windbg’s legal functionality, and I am going to use only a batch file (not powershell, or vbs, an old style batch only) and some Microsoft’s signed executables (some of them that are already in the system and windbg, that we will be dumped from the batch file). With this method it is not necessary to launch executables at user mode (only Microsoft signed executables) or load signed drivers. PatchGuard and other protections don’t stop us. We put our code directly into kernel memory space and we hook some point to get a thread executing it. As we will demonstrate, a malware consisting of a simple batch file would be able to jump to kernel, enabling local kernel debugging and using windbg to get its code being executed in kernel. Dumping files embedded into the batch file: a couple of methods for embedding and dumping binary files into the batch file. Enabling local kernel debugging: how to enable local kernel debugging from the batch. Patch kernel memory with windbg to inject and execute our code in kernel mode: a way to patch kernel memory and execute our code in kernel by using windbg local kernel debugging from the batch file). Finally, we will put all these things together to make a proof-of-concept batch file that will target a windows 8.1 x64 machine, and we will do some tests. Probably, there are lot of ways to dump files embbeded into a bat to disk. Here I’m going to talk about a couple of methods. It is possible to use the Microsoft tool makecab.exe (or cabarc.exe in previous versions of windows) to create a CAB file. This CAB file will contains the files that we want to dump, compressed. But we will add too a first file uncompressed, our batch file. To use makecab.exe we have to give to it the path to a .ddf file as parameter: makecab.exe /F makecab.ddf. This .ddf file instructs makecab.exe to create the CAB file. You can find information about makecab.exe here and about microsoft cabinet format here. Let’s suppose we have a file setup.exe (a executable that we want to dump to disk) and a file setup.bat (the main batch file). Having setup.exe, setup.bat and makecab.ddf in the same directory, we execute: makecab.exe /F makecab.ddf, and we get the CAB file. As we can see the CAB file contains a first file: the batch script uncompressed, and a second file: setup.exe compressed. If we rename the .cab file to .bat, and we execute the .bat file, it is executed without problems. The first binary contents (the CAB header) is ignored by the batch interpreter (it tries to execute it but it prints error messages), and when the interpreter finds the batch uncompressed code it executes this code without problems. As we can see this batch code executes expand.exe passing as parameter the own .bat file (that is a CAB file too), and the CAB file is uncompressed to the directory “expanded”. After that, setup.exe is executed. We will embed this text into the batch file, that will dump it to disk, and will use certutil -decode to decode this text to binary file again. As we can see in the previous code, there is a function named DumpBlock. This function receive as parameter a path to a file and two labels into the batch file, and it dumps to the file the content between both labels. After dumping the text to a file (file.enc), it calls to certutil to decode it to binary: certutil -decode file.enc file.bin. In this way we can embed as files (executables or any type of file) as we want into the batch file and dump them when the script is executed. 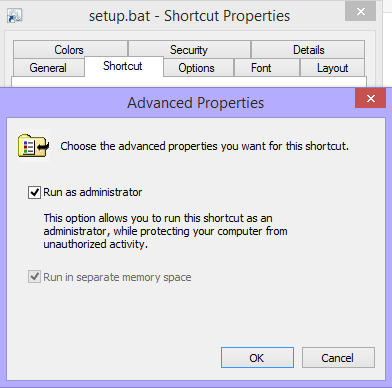 If you use PowerShell or Vbs there are different ways to force to show the UAC prompt asking the user to let our application to execute as administrator. But I wanted to use only batch syntax. For showing UAC prompt from a batch file i decided to use other method: dumping a .LNK file pointing to my own batch file. This .LNK will be marked with the option “Run as administrator”. In this way, when the .LNK re-launch our batch file, if we don’t have administrator privileges, the UAC prompt will be shown. schtasks /create /sc onlogon /tn setup /rl highest /tr "%0 /DOONLOGON"
You can see how the script enables local kernel debugging, it installs a task for being executed after rebooting, and it restarts the computer. With the methods employed in the previous sections we have dumped all the needed files to disk, we have showed the UAC prompt to get administrator privileges, and we have enabled kernel local debugging. The next and last step is to patch windows kernel memory to put our code there, and hook some function in kernel to get our code executed. And the most important part of this, is the windbg script jmpkernel_hookcreatefile.wdbg. You can see the code of this script in next paragraphs (as you will see the code of the script is well commented to understand perfectly how it works). In the script some addresses are hardcoded for my target testing machine. The target machine is an Windows 8.1 Pro N x64, and ntoskrnl version is 6.3.9600.17668. It would be easy to adapt the script for other machines or making a generic script without hardcoded adressess. Anyway, because this is only a PoC, i did it with some hardcoded addresses to not complicate it too much. The most important thing to comment of this script and the key to patch kernel memory from windbg local debugger is to use physical address to write the memory. Local kernel debugger doesn’t let us to modify some kernel memory address (for example, if we want to patch NtCreateFile function, it won’t let us). However we can transform the target virtual address to physical address, and write our modifications to the physical address. The command to transform VA to physical address is !vtop. The command to write to physical address is !eb. We will embed these files into the batch file, we will dump them together the script file, and we will execute windbg with the script. After executing the script, nt!NtCreateFile function will be hooked. We have used the memory space of nt!KeBugCheckEx to put our code there, then we hook a call into nt!NtCreateFile to call to our code in nt!KeBugCheckEx. From our code in nt!KeBugCheckEx, we jump to the original destination of the call, so the funcion is hooked and our code executed, but the system continues working without problems.